At least three ships about the length of two football fields are slated to arrive at ports in China by the end of this month, each carrying cargo from Elon Musk. 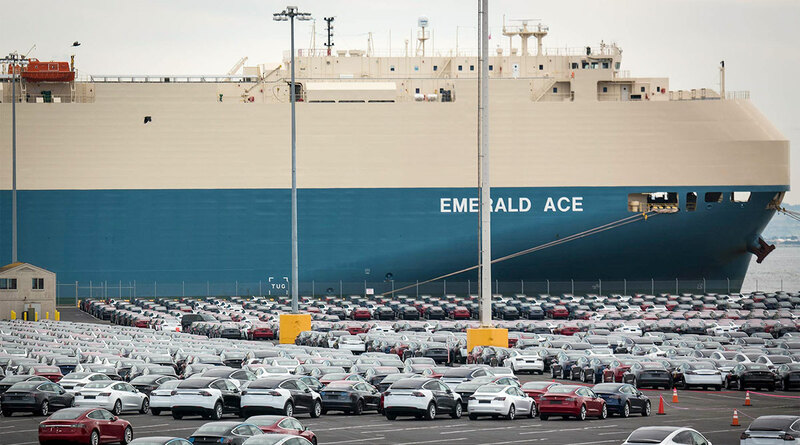 Tesla Inc. is loading as many Model 3 sedans as it can onto vessels destined for the People’s Republic ahead of March 1, when a trade-war truce between presidents Donald Trump and Xi Jinping is scheduled to expire. Musk fears the countries could ratchet tariffs back up, which would make the CEO’s electric cars more expensive in China and boost costs of key components the country sends to his U.S. assembly plant. Other carmakers are at risk of seeing expenses rise again if the Trump-vs.-Xi dispute flares back up. But Musk is in perhaps the most precarious position in the industry. Global giants such as BMW AG and Daimler AG can wiggle around the tariffs to an extent by boosting production at existing China factories, but Tesla’s manufacturing presence there was merely a muddy field as of last month. It won’t be assembling any vehicles in China until the end of 2019 at the earliest. “They’re uniquely exposed,” Sanford C. Bernstein analyst Robin Zhu said. Trump and Xi agreed to a 90-day detente in December. The United States said it would delay a planned tariff rate increase — to 25% from 10% — on almost half the goods it buys from China, worth some $200 billion. While officials have been negotiating since then, Trump has said he and Xi won’t meet again before March 1. On Feb. 12, Trump said he is open to extending the deadline if the sides are near an agreement. China has said its suspension of an additional 25% tariff on U.S. autos and parts will apply through the end of March. For months before the truce, China had slapped American-built cars with 40% levies. In recent days, a steady stream of trucks hauling Tesla models has arrived at the gates of Pier 80 in San Francisco, where workers can be seen unloading them into a parking lot packed with thousands of cars. The vehicles then are loaded onto ships for the approximately two-week journey to Asia. The vessel Glovis Symphony docked at the port of Tianjin early this week and is due to arrive in Shanghai on Feb. 13. Two more carriers, Morning Cindy and Emerald Ace, are at sea and scheduled to reach China’s shores Feb. 19 and Feb. 24, according to data compiled by Bloomberg. Other ships being loaded at Pier 80 are headed to Europe. The Model 3 is the linchpin of Tesla’s effort to appeal to a wider global audience, with Musk promising for years that a version eventually will be available for $35,000 before incentives. That’s generally in line with the average selling price of a vehicle in the United States. But following through on that vow has bedeviled Musk. The cheapest version available now — almost three years since he first showed a concept of the car — is $42,900. In Europe, where deliveries are just getting underway, prices vary by country, with customers in Belgium paying a base price of 58,800 euros, compared with 55,400 euros in Germany and 53,500 euros in France. In China, the Model 3 starts at 433,000 yuan. Some of the best-selling electric cars in the market — the world’s biggest for battery-powered vehicles — can be had for less than a sixth of that price. Beijing Electric Vehicle Co.’s EC Series and Chery Automobile Co.’s eQ are listed at 65,800 yuan after subsidies. Musk has a case to make that Tesla punches above its weight on trade. While researcher Autodata Corp. estimates the carmaker’s U.S. market share was only about 0.7% last year, U.S. Census Bureau data suggests the company may account for almost 16% of vehicle exports by value. If the trade war escalates, Tesla could shift part of its supply chain to other countries in Asia, or to Mexico, where it already has several established suppliers. The company also is working closely with government officials in Shanghai to build a vehicle and battery factory. Musk said he expects to make several trips to China this year.